We’re about one week out from the start of EAA AirVenture 2018 in Oshkosh, and we are excited! 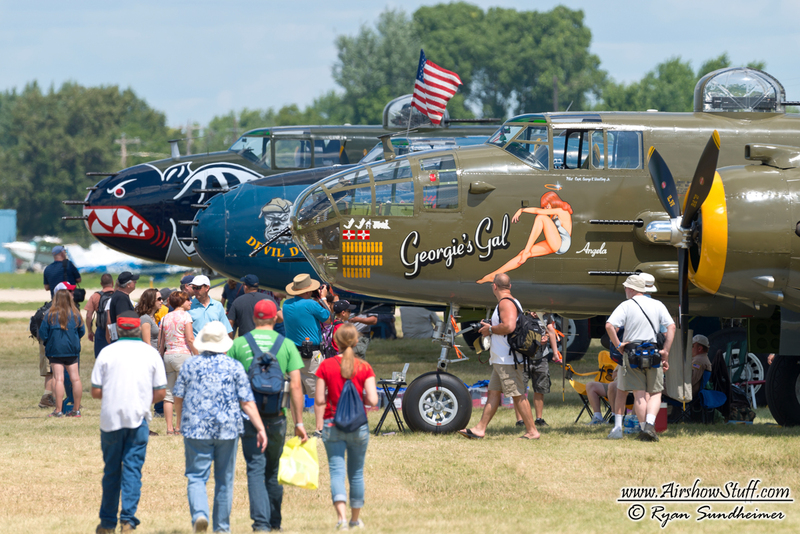 Oshkosh is not only an amazing airshow, it’s a chance to spend time with aviation friends from all over. EAA recently revealed most of the details of the airshow portion of the event, including some exciting items like a B-52 flyover with pyro! You can read more of the specifics on our forums. AirVenture is also the largest event of the year for us here at AirshowStuff, and we work very hard even before and after the official event to capture the very best videos and photos that we can. It takes months for us to edit and post all of the content we capture, and Oshkosh always proves to be among the most popular of the things we share. This is the first year that all four of the main team members (Ryan, Dave, Anthony, and Ricky) will be together at the event. We expect to have three different video cameras plus our SLRs, onboard cameras, scanners, and other equipment. It’s safe to say we don’t travel light! Follow our Facebook and Instagram pages for live streams and other posts during the event. Subscribe to our Youtube channel, where we will upload highlights during and after the event. Keep an eye on our forums and help us out by sharing your own photos/videos from the show, as well as any info you come across. Listen along to EAA Radio and LiveATC. We also invite you to step back to AirVenture 2017 with these two often-requested videos; our Oshkosh mega-compilations! Since we started these several years ago, they have grown considerably each year and we finally had to split the footage into separate compilations for the airshow performances and the arrivals/departures. Enjoy over 10 hours of continuous Oshkosh footage, and check back soon for even more!